Dr. Mel Dixon, DDS Welcomes You to Speedway Dental! Looking for a Tucson dentist? Look no further than Melvin M. Dixon, DDS. Dr. Dixon has over 20 years of clinical and technical expertise and is passionate about giving patients something to smile about. Dr. Dixon's practice was founded in 1960 by his father, who was also a compassionate Tucson dentist. Dr. Dixon took over for his father about 20 years ago and has earned a reputation for professionalism and a gentle touch. Dr. Dixon received his Doctor of Dental Surgery degree from Howard University College of Dentistry. He completed a general practice residency at the College of Physicians and Surgeons of Columbia University at Harlem Hospital Center in New York City. There he received extensive training in oral surgery, endodontics, prosthodontics, periodontics, orthodontics, pediatric, and cosmetic dentistry. From there, he returned to Tucson where he grew up. In addition to his years of service as a Tucson dentist, Dr. Dixon also spent time serving his country. Dr. Dixon was a major in the United States Air Force Reserves and served in Operation Desert Storm. Volunteering extensively throughout his career, Dr. Dixon recently returned from Guatemala with the St. Michael's Project and is now a participating dentist in the Smile Train volunteer program. Dr. Dixon also treats children in the Tucson Unified School District's Greyline Program, a local program designed to help schoolchildren get back to dental health who otherwise could not afford to do so. He is on the Advisory Board of Big Brothers and Big Sisters. Our dental office is set up more like a home. Here you'll find free Wi-Fi, a kid’s area with toys, a treasure chest filled with rewards for good visits, drinking water, and relaxing music including streaming Pandora stations tailored to your preferences. Dr. Dixon loves jazz, so you may hear smooth sounds from his favorite artists playing softly in the tranquil reception area. Our entire team is committed to making you feel welcome. We greet you warmly when you arrive. We keep as many as thirty different magazines in the office and provide hands-on treatment and open communication. Our office is equipped with intra oral cameras, digital x-rays, and other dental technologies. A team member will even notify Dr. Dixon when you leave so that he can personally say goodbye before you go. When your next appointment is due, we'll call, email, or send you a text message with a reminder. As a general Tucson dentist, Dr. Dixon offers a comprehensive list of services including: cleanings and exams, oral cancer screenings, periodontics, prosthodontics, endodontics, laser dentistry (including soft tissue laser dentistry for nonsurgical periodontal work), mouth guards, TMJ and sleep apnea treatment, dental implant restoration, and cosmetic dentistry. Please click on any of the links before for additional information about services we offer. We emphasize comprehensive preventive dentistry. Our hygienist is certified in craniosacral therapy, which provides relaxation through touch massage. Dr. Dixon also uses Arestin to help eliminate bacteria in pockets, which aids in laser dentistry for oral pathology. We also highly recommend the use of Rotadent tooth brushes, Waterpik flossers, and ultrasonic scaler tools. Be sure to give us a call to schedule for your free cosmetic consultation. For your convenience we offer no interest financing through CareCredit. Tucson Dentist, Mel Dixon, DDS of 151 Dental Care in Tucson, AZ is proud to offer general, family, emergency, cosmetic dentistry and more. 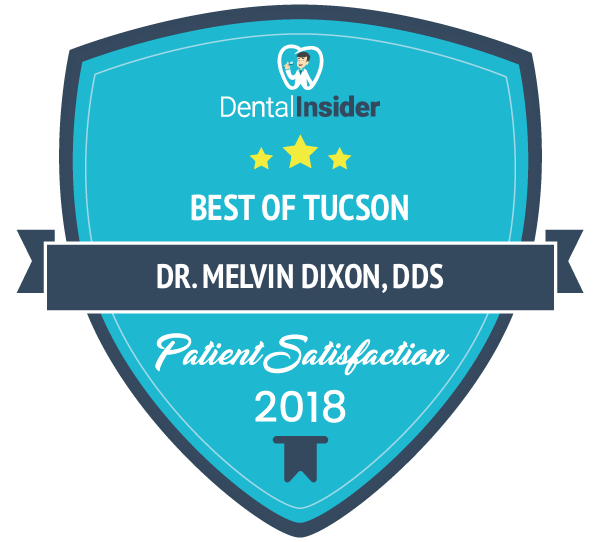 Visit your dentist today in Tucson, Dr. Mel Dixon.